On Wednesday November 8th, ASEED members attended to a lecture in a coworking space called ‘The 9th’ in the center of Bonn. There was an interesting talk led by Wayne Roberts, a food activist, policy analyst and writer, known for his involvement in the Toronto Food Policy Council. After a day of boring business talks at the COP23 about ‘Transition to a net zero future’ and ‘Green economy’, some activist friends told us about the TFPC talk. It was definitely worth it! Surrounded by a group of 40 people, most of them students in nutrition, agriculture and food policy, Wayne Roberts talked about the historical background and the motivations to start the council in Toronto in 1991. He explained that hunger and food distribution were big issues during the 1980s in the city. The main goals when creating the TFPC were to provide proper, nutritious food to the most vulnerable people and to ensure equitable access to food, community development and environmental health. With this concept and together with Roberts implemented the food policy council realizing that to make it happen all the stakeholders involved on the city food system should be working in the same direction. So along all these years, the TFPC has been gathering politicians, local farmers, local shopkeepers and leaders of large supermarkets. 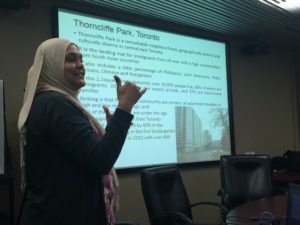 The TFPC is somehow free to make its own decisions on food policy issues, and they’ve been working to ensure food security and sustainable agriculture within the city. He also detailed several other benefits for cities to have gardens and fields (even small ones), for example to protect people from flooding or to reduce the time/energy/costs required for food transport. 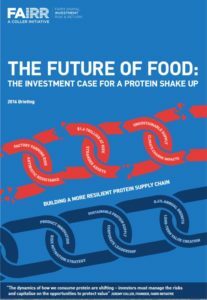 Another interesting statement from Wayne was that “local food strategy means that everyone involved has to represent public interests and not individual interests, otherwise it couldn’t work”… This is just the opposite of what is happening in the world, where agribusiness is making private profit rather than feeding people. In the coming month, we will gather information on similar bottom-up initiatives across the world. If you know of any similar project, please drop us a line. Get to know more about the TFCP and the Youth version of the Council. 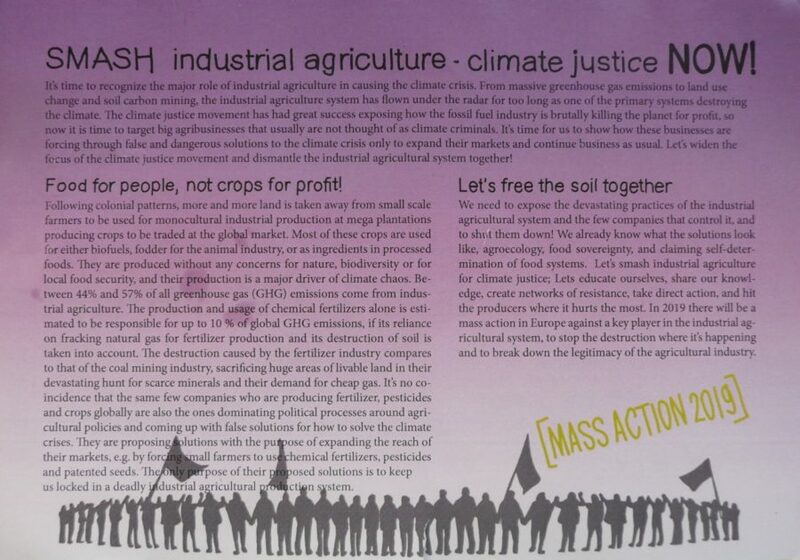 At several places in Bonn, we found a flyer announcing a mass disobedience action against industrial agriculture planned for 2019. With a good motivation and a nice picture (the stains were added later). But no contact address or website. That’s intriguing… Two days later in a strategic meeting about actions planned for the coming months and years, there was a woman from Denmark announcing the same action. But at the end of the meeting when there was the chance to talk to other participants, she had already left the room. Too bad, because this sounds like something people from ASEED could contribute to. Does anyone out there knows already more about the context of this action? We will do our best to get in touch with the people or groups behind this promising but mysterious plan! Indeed, FAIRR, not FAIR. This investors group, also present in the ‘Climate Action Zone’ at the COP published in 2016 a report about the investment risks in factory farming. Such an initiative could actually help leaders and market actors to finally talk about the elephant in the room at COPs: livestock emissions and the issues related to animal agriculture. FAIRR does not tackle the topic the way NGOs do, but it is not their job nor their ambition. 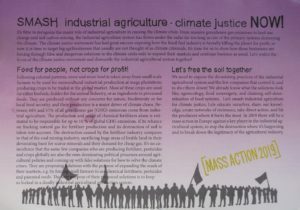 Just like in Paris around the COP21, ASEED brought materials for the Guerilla against greenwashing to Bonn. 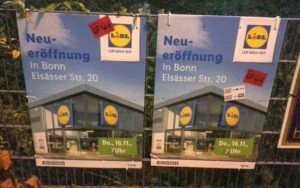 They were distributed at several activist points in Bonn, but also ‘surprisingly’ in and around the COP23 premises themselves. 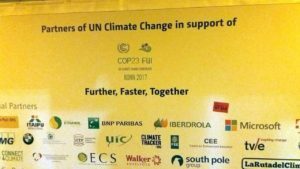 Indeed, we were not the only group or people questioning the presence of corporate polluters as sponsors of the conference or national pavilions. Barclays bank, champion of fossil fuel projects financing, was for instance the main sponsor of the UK pavilion. In the middle of the Climate Action Zone, carefully watched over by an impressive amount of security agents, we gave a pile of our ‘This company is as green as…’ stickers to a member of a Nigerian environmental NGO who thought the message was well suited for such an event. 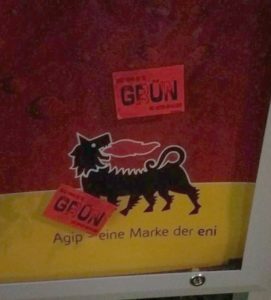 In the following days, the stickers were found on various advertisement signs in town, and even on the sponsor list inside the conference area. 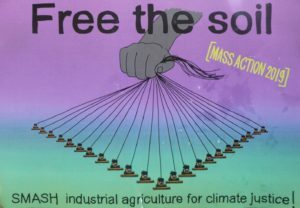 COP23 is now over, but the message of the Guerilla against greenwashing shall be repeated over and over. If you would like to get some of those stickers in German or English, do not hesitate to contact us! Read again the Corporate Cookbook – How climate criminals have captured COP21, from Corporate Europe Observatory. 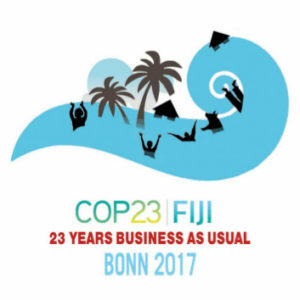 Most of the information in this report is still valid for the COP23 and following events!